Ground Ivy, also known as creeping charlie can be a terrible nuisance in a lawn that is difficult to kill. There are two ways to kill ground ivy organically. Use a solution of borax on it, or manually remove it. Borax can be found in the laundry aisle of many supermarkets under the brand name 20 Mule Team Borax. Borax is an natural occurring compound but it does not break down over time so repeated use can cause problems. Borax can also harm other plants including your grass, as well as your pets. A recipe for a borax solution to control ground ivy on bluegrass can be found here, but I do not recommend using borax unless your soil test shows a boron deficiency. Instead, you should work on manually removing and preventing ground ivy from your lawn. Growing a good, thick, long turf will help prevent ground ivy, as well as many other weeds, by choking them out. Ground ivy does well in shaded, fertile moist environments. Choose the appropriate grass to compete with it. But even if you have a nice thick lawn, you might still get ground ivy. Where I usually see it is around the edges of the lawn near planting beds or vegetable gardens. The ground ivy seems to start on the bare soil and then works its way into the lawn. For that reason, it's important to have a good lawn edging installed and use a good landscape edging and keep 3" of mulch on your beds to prevent weeds. The best lawn edging I have seen is Black Diamond Edging. It is 5.5" tall and thicker than most others. It also comes with 4 metal stakes. The height and the stakes help prevent it from heaving up due to frost. From what I understand this is the edging that good professional landscapers use. That's very important here in the north east where we get some pretty cold winters. Installed properly this edging should last a long time without lifting and keep your grass out of your beds and the weeds out of your lawn. It is not that much more expensive than the edging you can find in your local box store and you get a better edging that will last longer. A lot of edging doesn't come with stakes or comes with plastic anchors. I don't know why, but the stakes for landscape edging, even the plastic ones are pretty expensive. Plastic ones are about a dollar a stake, metal ones more. Use the link in the picture above. They have the best combination of price and shipping that I've found. OK, that helps keep the ivy out of your lawn, now lets talk about actually removing it. Ground ivy is a creeping plant. It has a rhizome that spreads across horizontally and every once in a while flowers and roots form, like vine. (As can be seen in the photo on the right.) This makes it difficult to pull, especially in hard clay soils. If you don't get the vine it will just grow again. This is also true for dutch white clover in your lawn. Pulling by hand doesn't work too well in the lawn. The roots dig in pretty firmly in clay soil. You start by pulling on a few leafs and if you're lucky you can see where the rhizome is and try to pull it up along with the leafs by pulling it parallel to the ground and shaking it to loosen but most of the time, it's just going to break and you'll have a hard time finding it again. That method is also time-consuming. A better way is to use a dethatching rake. It will help pull out he entire plant, rhizome and all. The Ames True Temper thatch rake seems to be the best. Ames has made garden tools for a long time and has a quality reputation. My local home improvement centers carried different brands that were more expensive. Use the link on the left to get it from Amazon. They have the best price I've seen and free shipping. You'll want work the area with the thatch rake from different directions to make sure you get all parts of the ground-ivy pulled up. As you start working the area you'll get a sense which way the vine is growing and you want to try to attack it perpendicular to its growth. Use the straight tines on the rake. The bent looking tines are used for cultivating soil which can be useful if you need to reseed some bare patches. You could use a dethatcher or power rake but with a thatch rake you have a bit more control and finesse that you don't get with a power rake. This is important because if you leave bits of roots or vine the ground ivy will re-establish. You can even make it worse. When you're done, make sure to rake up all the debris so that the ground-ivy doesn't re-establish itself. The best time to dethatch your lawn and to remove ground-ivy is in the fall (August-September) so you can overseed at the same time. By filling in your lawn and keeping it healthy with a good organic fertilizer program you can help crowd out weeds including creeping charlie. Dutch white clover is a little harder to remove if it's been growing a long time but I did manage to get quite a bit of it. The thatch rake is also obviously good for dethatching your lawn. Not as fast or as easy as renting a power rake, but if you don't have a huge lawn, using a thatch rake will give you a good little workout. So there you go, a chemical free, organic way to remove ground ivy and white clover! I read this a couple of days ago because I was wondering if a thatch rake might help and I was searching for information to back that up. This afternoon I decided to give it a try just using a little handheld 3 prong cultivator. I had a little bit of clover and more ground ivy. I have to say it worked well. The clover, ground ivy and other shallow rooted weeds came up but the established grass stayed put. Most of it anyway. I learned two things too. I thought I didn't need to dethatch but I probably do. I thought my lawn didn't have a lot of earthworms but I sure do. I didn't want to lose any so I spread out the debris and figured they'd head back underground since it was hot and sunny. Then I put the bag on the mower to sweep it all up. I only wanted to do a little bit with the cultivator but it was going so well I couldn't stop. Couldn't get it all because of the heat and awkward position. Thanks for confirming the tip and when I get a thatch rack to finish the job I'll make sure to come back and use your link! PS: You're right about the edging. I got some edging for $8 a roll that was only about 4" high. Didn't come with pegs (which are ! *@# expensive!). After a couple of winters it kept coming up and cracking until I eventually ripped it out. Are you sure this edging will last? Glad you found it useful. I think you'll find the thatch rake to be a lot easier on the back and knees and will help things go a lot faster. 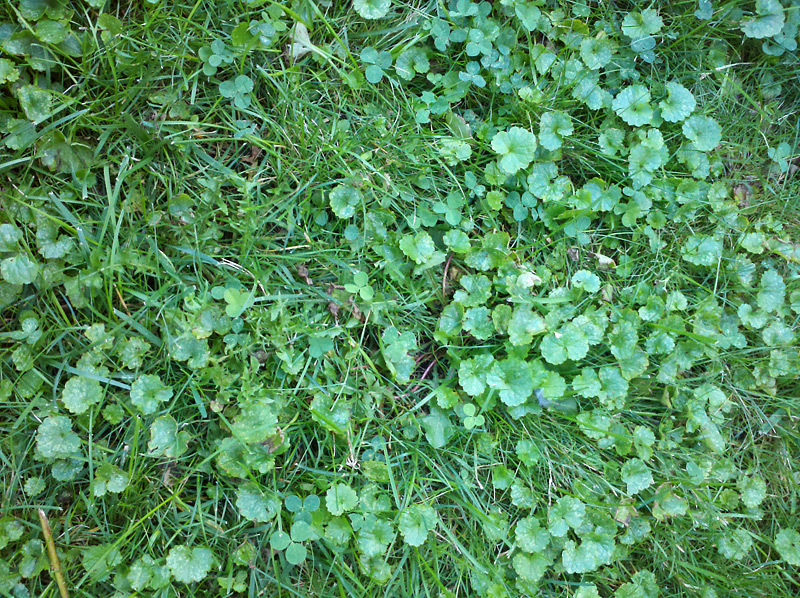 One thing I should have mentioned about clover is that it is generallly deeper in the soil than ground ivy. Sometimes it'll look like you're just combing the clover stems in an area where clover has been for a long time time. In those cases you might have to reach down, grab a few stems and slowly try and work it out after you've loosened the soil with the rake. If there is a big patch of clover you might end up with an area with very little grass that needs reseeding. Depending where you are and what type of grass seed you are planting, it might not be the best time to do this. It may take 2-3 years of proper lawn care and attacking the weeds to build a thick lawn that can crowd out most weeds. The edging is very good. It's important to install it properly. One mistake people make is installing it too high. Only part of the round top needs to be above the soil. Here's a site that has some good information on installing landscape edging. I don't recall seeing Borax on the periodic table of the elements. Doh! Wrong word. I meant to put naturally occurring mineral. I need to proof read more. 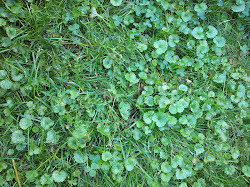 I thought white clover was beneficial to lawns, as it is nitrogen-fixing. Organic lawn care by definition rejects monoculture! Some people have issues with clover in lawns for various reasons. Could be because they don't like how it looks or could be because they have someone with a bee allergy in the family. Bees are attracted to the flowers and they don't want a loved one to have to worry about bees in the lawn. A typical lawn will contain more than one type of grass so wouldn't be exactly a monoculture. Most seed mixtures will either contain a variety of different types of grass such as tall fescue, kentucky blue grass, fine fescue, perennial ryegrass, etc. Even with a single family of grass like tall fescue or kentucky blue grass there will be 3 or more different cultivars for diversity.